I was recently reminded of the Seafood Watch List (thanks, Dol!) which is a great list, compiled by the Monterey Bay Aquarium, of which seafood to buy or avoid, helping consumers and businesses become advocates for ocean-friendly seafood. I was much more aware of this while living in Seattle where we were surrounded by ocean. When we first arrived in middle Tennessee, I didn’t really eat much seafood, being completely land-locked and all. Well, slowly we sort of let it creep back into our diet and thought we were being responsible by purchasing it from good markets and such but sort of forgot about the seafood watch list and our responsibility to know what we are purchasing. I welcomed this reminder to take some responsibility for helping to keep our sea life healthy! So with this, I offer up a few new takes on some old favorite recipes. Cut the bacon in small pieces and cook in an iron skillet over medium heat. Once done, remove bacon from pan and set aside, leaving the oil in the pan to cook the vegetables in. Place onion in pan and stir. Next, add garlic and pepper. Stir. Let it cook for several minutes. Mix flour with chili powder, garlic powder, onion powder, thyme, sat and pepper. Toss a splash of buttermilk over the cut okra and then mix the okra into the flour mixture. Add okra and mushroom to the pan with the onions and peppers. Stir occasionally so the okra does not stick to pan. When vegetables seem almost done, add in tomato, fresh herbs, and slowly add the stock and stir. Let cook for a couple more minutes. Add crumbled bacon. Serve over cheese grits (recipe below). For these, I use really good quality, old fashioned, stone-ground grits which you can usually find in nicer grocery stores, specialty shops, at an old mill out in the country, or online. I have found that the cooking instructions on the bags vary quite a bit for these and it all kind of depends on the texture you want, similar to oatmeal. Some people like their oatmeal creamy and some like it thicker and slightly lumpy. I tend to go for a creamier texture for my grits but you can play around with how long you cook them, how much liquid you add, etc. until you find the right texture to suit you. Cooking instructions usually have you soak the grits in the water to allow the hulls to rise to the top so you can skip them off. I always omit this step, opting for a little more grit and texture. Place the water in a pan on the stove. Add the grits and bring to a boil. Stir and reduce heat to a simmer. Cover. Cook for about 30 minutes, stirring occasionally. Pour buttermilk in a little at a time and stir, as the liquid starts to all be absorbed and get thicker. Once you get a nice creamy texture and the grits aren’t too tough to taste, add the cheese, salt, and pepper and stir. Total cooking time usually takes 30-45 minutes for me. 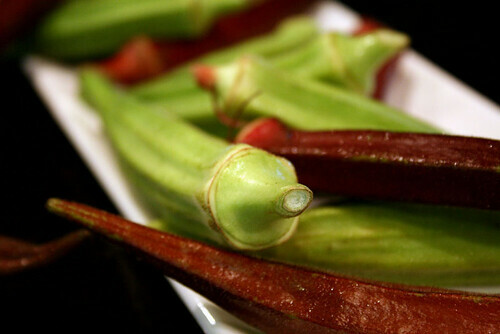 Okra originated from Africa, where it still grows wild. 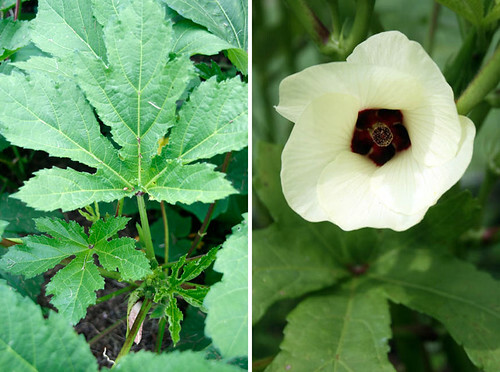 It is a tall, very warm weather plant related to hibiscus and cotton which explains why our hot Southern summer climate provides the perfect growing conditions. The flowers are very hibiscus-like. The finger-like pods are sometimes called, “lady fingers” and are actually immature seedpods that develop from the blossoms. 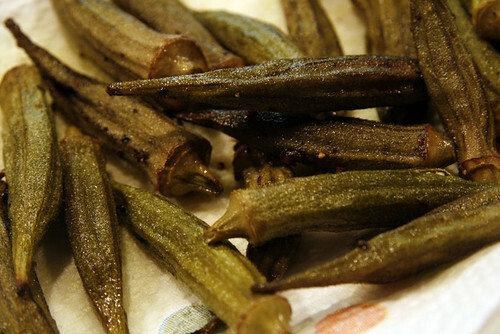 Fried okra is a classic Southern staple. We’ve been growing okra in our garden since we moved to Nashville. The plants are very plentiful so after frying it a couple times, you really do have to come up with new ways to incorporate it into your meals. Here are a couple of our favorite ways to enjoy okra. Sterilize the jars in boiling water, put the garlic, peppers, and dill in. 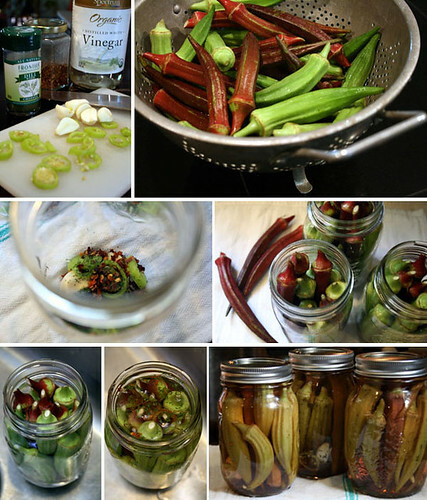 Next, stuff the jars with washed okra. Heat water, vinegar, sugar, and salt in a sauce pan and then over top of the okra in jars. Seal them up. Wait at least one week to open! This is so super easy to make and makes a great summer side dish. I especially like it with a yummy sandwich! Heat over to 425. Spread okra pods out on a cookie sheet. Lightly drizzle a little olive oil over and sprinkle with salt and pepper. Cook for 10-15 minutes. Another favorite seafood recipe of ours from the Pacific Northwest, which is originally from Italy, is Seafood Cioppino. This seafood stew is especially good made in the South, I have found, with amazing summer vegetables. I realized, however, that it is not the most environmentally responsible dish for me to make so I came up with this Southern, fresh-water version. Heat oil in large pan over medium heat. Add onions and saute for a few minutes. Add garlic and squash and stir. In a medium sized bowl, mix flour with spices. Cut catfish into 1-inch pieces. Dredge fish pieces into the flour mixture and place in pan. Cook fish for a few minutes on both sides but be careful not to overcook. Add in tomatoes and stock. Cook for a few minutes and then simmer for a few more minutes to thicken. Add fresh herbs on top to garnish. 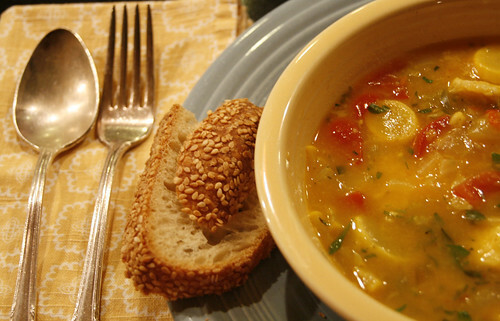 Serve in a big bowl with a salad on the side and some good, crusty bread! For more information on our oceans and ways to find responsible, renewable strategies that safeguard the natural systems that sustain us, check out one of Dolan’s current reads, Sylvia Earle’s book, The World Is Blue. This summer, eat responsibly and enjoy the splendor of the ocean!